Fairfield Prep's David White, pictured in the team's May 13 game against Xavier, scored four goals in the Jesuits' 14-2 win over the Falcons on Saturday at Alumni Field. Fairfield Prep aced its quarterfinal lacrosse test on Saturday. The Jesuits held Xavier without a shot for 10 minutes, didn't let the Falcons have the ball for the first four minutes, and beat them 14-2 at Alumni Field to set up a marquee semifinal against Ridgefield on Wednesday. "I thought, the first period, we played literally foolproof lacrosse," Jesuits coach Chris Smalkais said. Top-seeded Ridgefield (17-3) awaits the fourth-seeded Jesuits (16-4) in Wednesday's semifinals, with third-seeded Staples facing second-seeded Simsbury on the other side of the bracket. Fairfield Prep and Ridgefield will play at McMahon at 7:15. "(Ridgefield is) a very talented team, obviously, the No. 1 team in the state," said senior midfielder David White, who scored four goals on four shots against Xavier. "No game is easy." Possession allowed the Jesuits (16-4) to build up their lead. Kevin Brown's goal off James Marusi's rush beat the first-quarter buzzer to make it 10-0. "The second game of the playoffs, it's obviously a huge game," White said. "For the seniors, it's our last game on this field. We wanted to come out and have a huge game." It was 7-0 before the Falcons finally beat Troy Foreit and his faceoff wingmen on a draw. The Falcons promptly gave the ball away. "It's been Troy all year," Smalkais said. "Troy has been arguably our best player all year." The Jesuits led 13-1 at the half; the entire second half was played running-time. Kevin Brown, one of 13 seniors, had three goals and an assist. Junior midfielder Austin Sims had a goal and three assists. The semifinal and a possible final will follow diplomas for the Jesuits' 13 seniors. "We've got a pretty large senior group," Smalkais said. "To stay focused here post-graduation some years has been tough for us. This group will meet the expectations." What makes him think so? "I think they have great chemistry because they get along," Smalkais said. "We've checked our egos at the door. We'll share the ball. We'll share our successes." 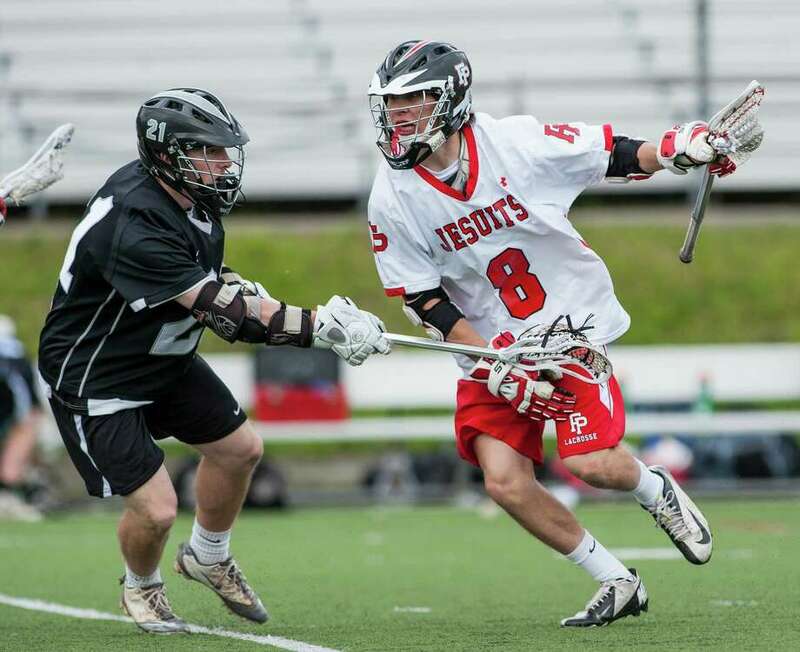 The Jesuits and Tigers will meet in the Class L playoffs for the fifth time in six seasons. They've played three times in the finals, including a split of the past two championships, the Tigers in an 11-10 classic in 2011, the Jesuits with an 8-6 win last year. Fairfield Prep also won the 2008 final 15-14 in triple overtime.